There is a beautiful elegance about OlliOlli2: Welcome to Olliwood; a kind of sublime state of Zen you reach as you fly through its levels in pursuit of that elusive high score. Like its prequel, OlliOlli2 is a reduction of skateboarding into its purest form; a tactile choreography of tricks strung together to complete objectives and compete against your friends. 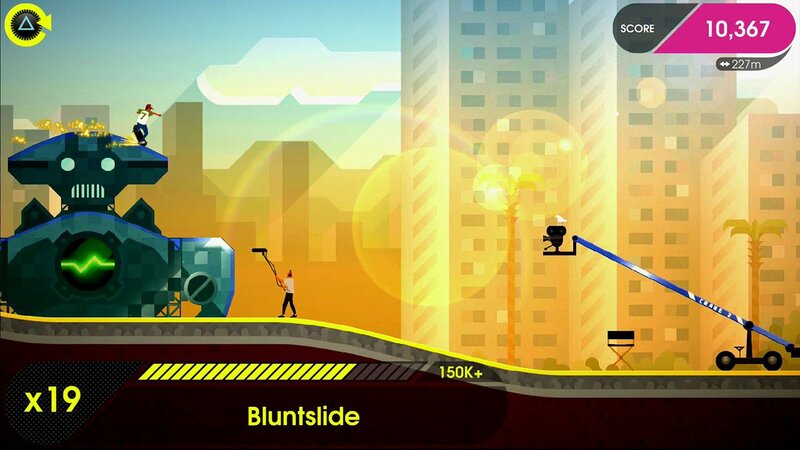 OlliOlli2 is the best kind of sequel: it’s bigger, better, and more ambitious. 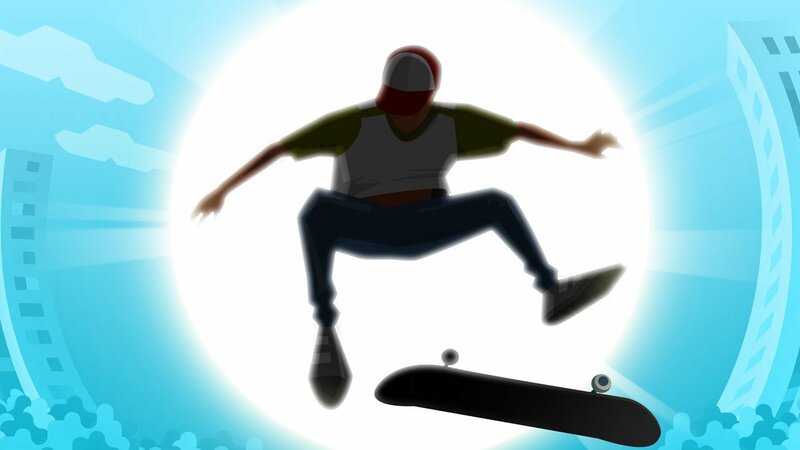 The result is a stylish and addicting skateboarding game that, left unchecked, will certainly devour hours of your time with its ruthless demand for perfection. Originally released for the Playstation 4 and Playstation Vita, OlliOlli2 is finally giving those on the PC another dose of the only meaningful skateboarding game released in almost five years. But while the genre for extreme sports games continues to fade to memory, OlliOlli2 doesn’t distract itself by chasing the threads of fallen rivals. Instead OlliOlli2 forges its own path by blending the precision and grace of the sport with more arcade-inspired sensibilities. In that sense, OlliOlli2 is also incredibly simple—free from the weight of supporting a big open world, creating some semblance of a story, or even navigating the pitfalls of operating in a three-dimensional space. OlliOlli2 brings the art of skateboarding back to basics. The campaign mode features five environments, each divided up into 10 levels. Each level is a long string of ramps, rails, and obstacles to avoid as you work to string combinations of tricks together and complete a set of accompanying objectives. There are also a host of multiplayer options, including a daily spot which gives you a single chance to set a global high score. Failing to land a trick or crashing into an objective requires starting the level from the beginning and trying again. It might sound frustrating, and in practice it certainly can be, but OlliOlli2 is aided by how quickly you can get back on the board. Reloading a level after a failed trick or a missed objective is nearly instant, which never gives you a moment to catch your breath. The level design in OlliOlli2 is suitably blockbuster focused, pulling from the common backdrops of Hollywood and, like with the skateboarding itself, reducing it into a minimalist tapestry to inject flavour into the level. You’ll skate through zombie apocalypses, Wild West ghost towns, and launch yourself over pits of bubbling lava in a jungle setting. Paired with the wonderfully catchy electronic music that accents your pixelated tour through Hollywood film sets, OlliOlli2 is simply a joy to experience. Though the art is simple, it only serves to highlight the beautiful and expressive animations of your skateboarder. Your skateboard flips around beneath your feet with surprising fluidity, adding to the air of grace imbued into every aspect of OlliOlli2. The vibrant visuals and melodic music only serve to hide what a punishing game OlliOlli2 can really be. On the PC, players will absolutely want to use a gamepad to play rather than a keyboard because of how tricks are triggered in OlliOlli2. Weaving the thumbstick in various patterns performs tricks which can also be strung together with a variety of grinds to perform on rails, as well as manuals, reverts, and spins to push your combo multiplier ever higher. However, where most skateboarding games emphasize the difficulty in pulling these stunts off, OlliOlli2 emphasizes the timing of landing them. Each trick must be finished with a perfectly timed landing by pushing a button the instant your wheels hit the ground. Succeed and you’re rewarded with the full potential of your score; fail, and you’ll earn an amount so pitiful it’s worth restarting the level to try again. But as levels begin to stitch ramps, rails, and obstacles in ever more complicated patterns, fully utilizing your arsenal to squeeze the highest score you can manage from a level can become a maddening pursuit of perfection. Pulling off the perfect combo becomes an intricate flurry of button presses and thumbstick maneuvers that, the moment your wheels hit the ground at the end of a level, that sudden release of tension and satisfaction at your high score becomes an intoxicating reason to go back and try for higher rewards. Before you know it, hours have melted away. That being said, OlliOlli2 is not without its pitfalls. For one, the act of perfectly landing your tricks is just ambiguous enough to open itself to suspicions that the game isn’t always playing by its own rules. At the highest difficulties, OlliOlli2 can stray from demanding to frustrating surprisingly quickly as your score is spoiled by a landing that you swear you timed properly. Furthermore, the game rarely instructs you as to what you did wrong beyond the initial assessment of your poor landing. Frequently I found myself bailing or missing an opportunity to land on a rail for no reason that I could discern. Understanding the surfaces of objects in various levels can also be annoying, as what you thought was a rail to grind on turns out to be a flat surface to land on. But even if these issues lead to moments where you’ll struggle not to throw your arms up and storm out of the room, the siren song of OlliOlli2 will always lure you back. OlliOlli2 has extracted the very essence of skateboarding and poured it into two-dimensional bliss. Though frustration is guaranteed to creep in periodically, too much of what OlliOlli2 showcases in its eye-catching art, absorbing music, and rewarding play is beyond being poisoned by the few issues that it has.